Energy can be anything that helps living organism to survive in the ecosystem. So, when we talk about energy, the main source of energy in the earth is the sun. Sun is the main source of heat and light energy. Likewise, there are different tropic levels and each tropic level has different organisms that use this energy in different forms. First tropic level is occupies by plants, bacteria and algae. Here, the energy from sun is converted to chemical energy that is used during the process of photosynthesis. We know that carbon dioxide is taken in by the plants and oxygen is given out and in this process the product is thus obtained. Hence, for the photosynthesis to take place, energy from sun is very much essential. Now, is the second tropic level that is occupied by consumers. They eat primary producers and get the energy indirectly in different forms. Likewise, third tropic level is occupied by the decomposers that return the energy back in the ecosystem by the process of decomposition. During this process of flow of energy, if the total solar energy obtained from the sun is 100% then only 10% of that energy gets transferred to next tropic levels and rest 90% goes wasted in several other task like respiration, decimation, maintenance etc. so, it can be said that primary producers receive maximum amount of energy whereas primary, secondary and tertiary consumers receive only 10% of leftover energy. That is to say, on the total production of energy in each tropic level only 10% is passed to the next tropic level and this way the cycle goes on. Therefore, it can be well said that among all, decomposers holds the major importance because they return energy in the ecosystem in the form of heat. Since ecosystem have different tropic level it is important to note that how many tropic levels exist in the ecosystem. So, for this tropic level varies with the types of ecosystem depending on several other factors like the structure, size of the animals present in each tropic level. Hence in comparison with marine ecosystem, land ecosystem has less tropic level. The difference is due to many factors that relates to size of producers. Firstly, marine producers called phytoplanktons are small in size and grow much faster in comparison to land producers. So in that run they utilize only less energy for growth and maintenance than the land producers. Secondly, phytoplankton are generally eaten whole by the consumers whereas in case of land, only certain parts of plants are eaten by animals and energy in rest parts are all preserved. So, very less energy gets transferred in the upper level. 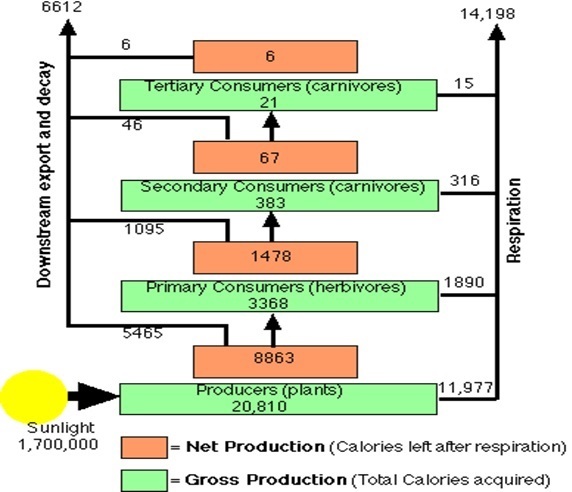 Moreover, animals in higher tropic level have to forage harder to meet their caloric requirement and this is the reason population from basic to top level in the ecosystem also goes on declining whereas those in the basic level of ecosystem can easily meet their requirement due to available sources in large number. It can be better described with an example, plants have enough of sunlight, so we can see grasses, crops, plants, tress everywhere even if not much care is given they grow on their own. Animals that eat these plants are less in number than the available plants but their requirement are still fulfilled easily. Then comes secondary consumers that eats primary consumers and their number is still less than the primary consumers and likewise the steps goes on. Therefore, in the ecosystem while accounting for the flow of energy two terms holds special importance. GPP and NPP, here GPP means gross primary production and NPP means the met primary production. GPP means the output given by primary producers, i.e. the organic matter produced by the plants and NPP is the available energy that plant can use for their growth after its usage in respiration. But when we talk about productivity, it must be noticed that it also depends on the climatic condition of that place. If the environment has good moisture and warm temperature, productivity is high but in the dry lands productivity generally decreases. Even at particular temperature productivity is high whereas below and above that temperature it tends to minimized.